Anyone who has ever played at a renowned online casino has probably already heard the name Microgaming. The latter is among the frontrunners in the online gambling industry and is regarded as one of the key casino software developers in the world. Microgaming’s creations are easy to spot – each game on the developer’s portfolio impresses with unparalleled depth in terms of visuals and sounds, not to mention the interface is so user-friendly that even first-time players are able to find their way around. Slot fans have this leading software supplier to thank for some of the most innovative slot titles one can possibly play online. Some of those go hand in hand with gargantuan progressive jackpots that can transform lucky players into millionaires. Read on to find out more about Microgaming’s history, achievements, and the key features of the jackpot slots, offered by the developer. Microgaming is largely considered a pioneer in the development of online gambling solutions. Interestingly enough, the company started out over twenty years ago when it launched the first ever online casino, the Gaming Club, in 1994. Several years later, Microgaming decided to head in a different direction and concentrate its efforts primarily on casino software development and licensing its creations to other web-based gambling operators instead. Microgaming’s impact on the industry is impossible to deny. The software developer is to be held responsible for the launch of the first ever wide-area progressive slot in the world, Cash Splash, which was introduced to enthusiastic slot players the world over in 1998. Two years after, the key supplier went on to launch the first Instant Play software, allowing players to enjoy their favorite games without having to install any downloadable casino clients. However, it was in 2002 that Microgaming really took off. The developer’s hugely popular Mega Moolah slot entered the Guinness Book of World Records for paying the biggest progressive slot prize in history. It is fair to say, the software supplier paved the way for mobile gaming, when in 2004, it became the first developer to release a slot compatible with mobile devices, the Double Magic. This was followed by yet another success when the company launched the first branded slot title in the industry, Tomb Raider. But this is not all. In 2006 alone, Microgaming’s progressive slot titles boasted cumulative payouts of over $200 million. The developer is also responsible for introducing the so-called “All Pays” feature, which went on to become one of the most widespread slot formats in the industry. Slot fans have the key developer to thank for the Gram Slam of Slots – the first tournament of its kind which accepted entries from various Microgaming-powered casinos. In 1997, the software developer became one of the founding members of the Interactive Gaming Council, an organization that focuses on promoting fair play and responsible gambling, which exists to this very day. Microgaming’s slots, progressive or not, are certainly easy to recognize. Each slot on the developer’s gaming portfolio is like a feast for the eyes thanks to the outstanding graphics and engaging animations that have become somewhat of a trademark of Microgaming’s. The visuals are crystal clear and exceptionally vivid, while the digital sound effects add further authenticity to the games. As far as gameplay is concerned, you are unlikely to face any difficulties in finding your way around, even if you have never spun the reels of an online slot. The interface of the games is quite user-friendly and easy to navigate. Some Microgaming slots utilize the 243-Way-to-Win format, allowing players to land a greater number of winning combinations on the reels. There are no paylines as such in these games. Thus, there is no need for players to select the lines they wish to bet on. The combinations of matching symbols simply need to appear on the reels from left to right in order for players to collect a payout. The Paytable Achievements is yet another feature of interest that can be found on some advanced Microgaming slots. Players earn their achievements by completing all possible payouts for each symbol on the reels. The more one progresses through the game, the greater the rewards they earn. These include rounds of free spins, bigger multipliers, and retriggering of the bonus spins, among others. Some slots, courtesy of the leading software developer, are linked to Microgaming’s progressive jackpot network. The progressive prizes often exceed $10 million as the bets on all these slots contribute to the accumulation of the pools. What is more, the slots in question are linked across all online casino operators that run on Microgaming’s platform. What is interesting here is that the current jackpot amount is not adjusted on the basis of present currency exchange rates. This means that if any given player from Germany, for example, triggers a ten-million-credits jackpot while playing in EUR, they will be paid out the exact same amount in their currency of choice. If an American player bags the pot using USD as a currency, their prize will not be converted from EUR to USD. The slots that feed the jackpots from the progressive network are as follows – the classic Mega Moolah, Mega Moolah Isis, Mega Moolah 5-Reel Drive, and Mega Moolah Summertime. What is more, these offer several different rewards as there are four jackpots to be won, namely the Mini, Minor, Major, and the Mega jackpots. Needless to say, the first two are smaller and hit more frequently. But it is the Mega jackpot that transforms recreational slot players into millionaires. Once somebody wins one of the four progressive prizes, the respective jackpot is reset to its base-seed level. You will be able to read more detailed information on some of the progressive Microgaming slots in the next section of the article. The largest jackpot starts seeding at the impressive amount of $1 million, which explains how the prize skyrockets to a seven-figure sum so quickly. As mentioned previously, Microgaming’s slots are among the titles that offer some of the largest progressive jackpots in the world. This applies in full force to the slots from the Mega Moolah series which are linked to Microgaming’s jackpot network. The interface of the slots is roughly the same, but the themes differ. The original Mega Moolah slot was inspired by the African savannah and utilizes various wild animals as symbols on the reels. Both the classic Mega Moolah and its Egypt-themed cousin, Mega Moolah Isis, feature 25 paylines, spread across five reels. There are 9 paylines in Mega Moolah Summertime and 15 paylines in the 5-Reel Drive variation of the slot. But more importantly, each of the four titles provides players with the opportunity to bag one of four different progressive prizes. The Mega jackpot is what all slot fans covet as it seeds at $1 million and the amount may well exceed $10 million on occasions. The second largest prize is the Major jackpot which seeds at the starting amount of $10,000 or the equivalent in other currencies. The other two prizes are smaller and hit more often. The Minor jackpot starts accumulating at $100, while the Mini prize seeds at the humble amount of $10. Other cool features of the Mega Moolah slot series include wilds, scatter symbols, rounds of free spins, and multiple-coin bets. The four jackpots are awarded at random. Players are taken to a separate screen where they need to spin a wheel, containing different guaranteed cash prizes as well as the jackpots. 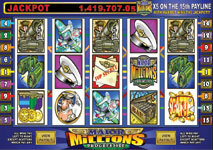 Major Millions is another popular Microgaming title that comes with a colossal progressive jackpot. This is a fun slot, which boasts an aviation theme. It, too, is available in several enticing variations, MegaSpin, the 5-reel version, and the classic 3-reel Major Millions slot. Similarly to the Mega Moolah slots, the Major Million titles are linked in a progressive network, so all three variants contribute to the accumulation of the huge jackpot prize. The latter typically seeds at 250,000 credits, when reset. Slot fans, looking for life-changing payouts are also recommended to give Microgaming’s King Cashalot slot a try. Although more simplified in terms of graphical presentation and animations, this 5-reel slot with 9 paylines is well worth your time as it is attached to a hefty progressive jackpot, which seeds at 100,000 credits. 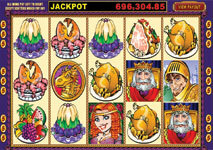 As the name suggests, the slot is based on a medieval theme and features some fun and colorful graphics. Players would also benefit from a variety of extra features, the likes of scatter symbols, multipliers, and a “pick-until-collect” bonus game.